I am a self confessed makeup addict and MAC is my heaven. I am literally like a kid in a candy store when I am in there. My two weaknesses are blushers and lipsticks. 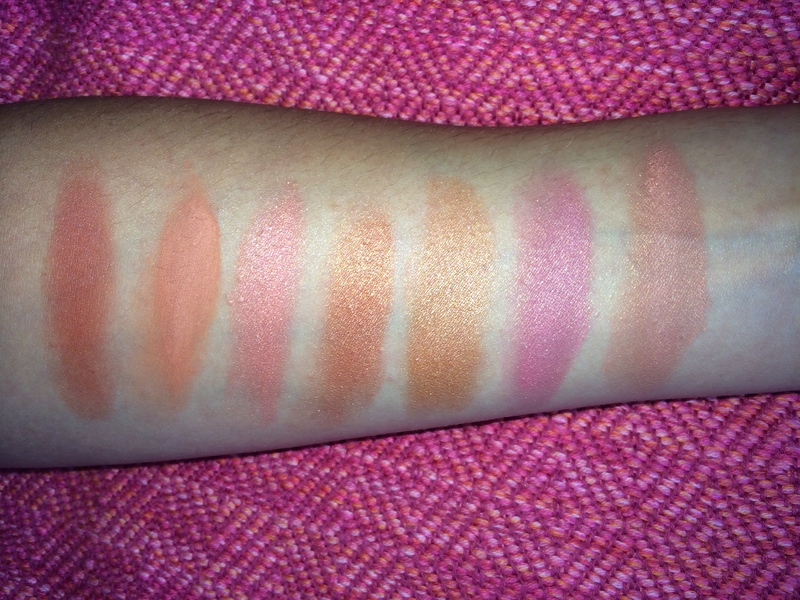 I have already shared my top 5 MAC lipsticks with you all here. I think it’s now time to reveal my collection of MAC blushers. It’s not quite as extensive as my lipstick collection, as I am a huge fan of a statement lip. 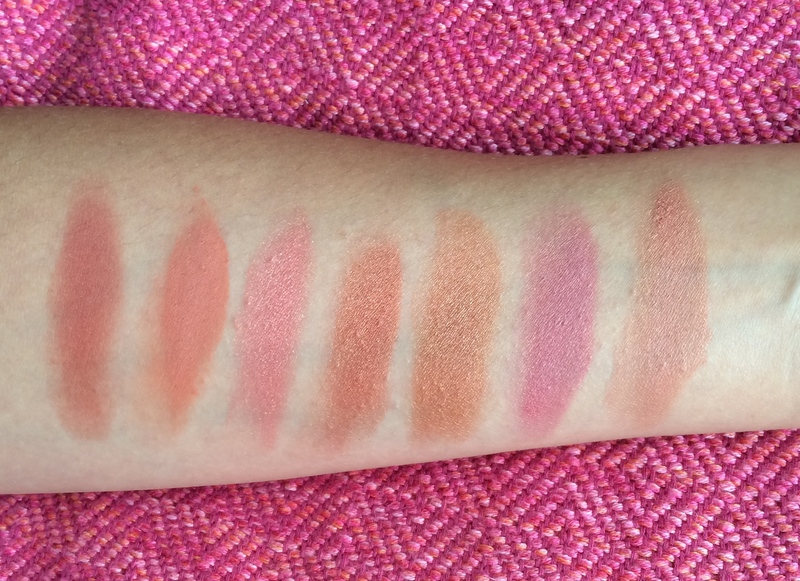 From left to right: See Me Hear Me, Melba, Peachykeen, Peachtwist, Sunbasque, Gentle, Warm soul. See Me Hear Me came out with the Alluring Aquatic collection. It is a plummy peach colour with a nice sheen to it. See more pictures of it here. Melba is a matte peachy pink colour. Great for days when you don’t want too much shimmer. Peachykeen looks great paired with an orange lip. It’s a peachy pink shimmery blush. Peachtwist is a newer addition to my collection. It has a nice bronzy peach shimmery finish. Great for when you want to be a glowing tanned goddess! Sunbasque is what I’ve been reaching for in the warmer months. It’s bronze finish means that I can skip the bronzer when wearing this. Gentle is a deep pink mineralize blush. It’s quite pigmented so you need to be light handed with it or else you’ll end up looking like a rag doll. Warm Soul is my go to blush in Winter. It’s a mid tone beige with gold pearl. Perfect to add a bit of a glow without too much colour. 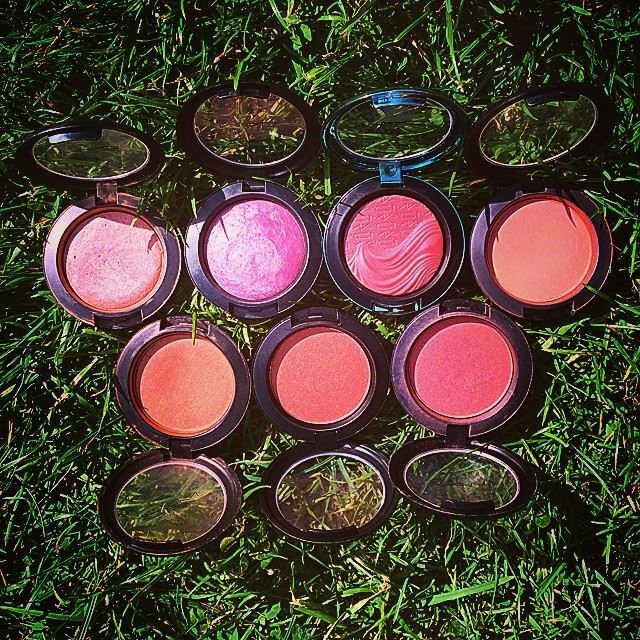 What MAC blushes do you reach for? PEACHES I’ve got my eye on you! Hey! I’ve nominated you for the Beauty Blogger of the Month award hosted by Cecilia. Great thank you so much! Love your blog, I’m useless at makeup. I was wondering whether there’s any one blusher you would recommend for a pale complexion, out of these five? I wouldn’t recommend any of these for a paler complexion. If I were you I would go for MAC FLEURPOWER. I have bought that for friends with a pale complexion and it looks great on them! Oh yes you have to try them! I love a good peach blush, I’m sure you can tell haha !